Policy debates are often grounded within the conceptual confines of a state-market dichotomy, as though the two existed in complete isolation. In this innovative text, Marc Allen Eisner portrays the state and the market as inextricably linked, exploring the variety of institutions subsumed by the market and the role that the state plays in creating the institutional foundations of economic activity. 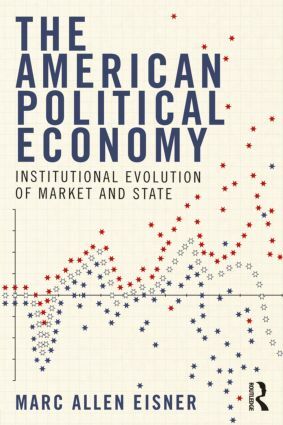 Through a historical approach, Eisner situates the study of American political economy within a larger evolutionary-institutional framework that integrates perspectives in American political development and economic sociology. This volume provides a rich understanding of the complexity of U.S. economic policy, explaining how public policies become embedded in bureaucracy and reinforced by organized beneficiaries and public expectations. This path dependent layering process helps students better understand the underlying historical dynamics, which provide a clearer sense of the constraints faced by policymakers now and in the future. Thorough coverage of the entitlement crisis, globalization’s impact on the U.S. political economy, and the recent financial crisis in the final chapters demonstrate the importance of this historical institutionalist framework.